One of the most common questions we receive is “how can I add battery storage to my solar array?” Adding battery back up to your home can seem like a daunting challenge. That’s why we’ve put together a free guide to battery storage for homeowners. It is designed to walk you step by step through the process. We examine the types of batteries that are available and how they can be used in your home. We then dig into the economics of battery storage to help you understand if adding battery storage can make financial sense for you. The information in this guide is not just theoretical. In 2018, we launched our first storage co-op. Built on the same model we use to help thousands of people a year go solar, this co-op helped Maryland homeowners add storage to their homes. There are many reasons to add battery storage to your home. In most parts of the country, battery storage for residential homeowners is mainly used to provide backup power during power outages. When the utility grid goes down and you lose electric service, you can use a battery system to power some or all of your household electricity needs (called “loads”). The battery backup system works by isolating certain loads from the main utility system with something called an “automatic transfer switch”. You are then able to power these loads with electricity stored in the battery bank. Loads can range from small (light bulbs, toasters, a hair dryer) to large (a refrigerator or a well pump). When the utility grid power returns, the backed-up loads in your home then automatically reconnect to the grid. The result is that these “critical” loads receive power even when the grid is down, switching seamlessly between utility electricity and stored electricity from your battery. There are several different types of batteries available on the market to provide battery backup power to your home. Different battery types have different “chemistries”. Our guide covers the two most common types: lead acid and lithium-ion. Lead acid batteries have been around a long time. For decades, they’ve powered cars, tractors, submarines, and have been used to provide backup power to homes and buildings. Lithium-ion batteries a higher density of energy (more energy per unit of space) than traditional lead acid batteries and can be used (or “cycled”) more often during their lifespan. The upfront cost of lithium-ion batteries is higher than that of lead acid batteries. However, because of their longer lifespan (~ 10 years) and their ability to be charged and discharged more frequently, lithium-ion batteries have a lower lifetime cost than lead acid counterparts. 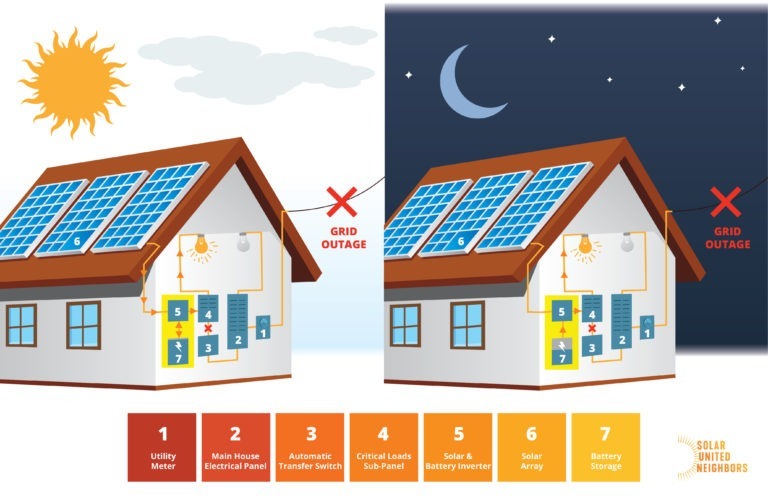 If you’d like to learn more, please download the Solar United Neighbors battery storage guide.